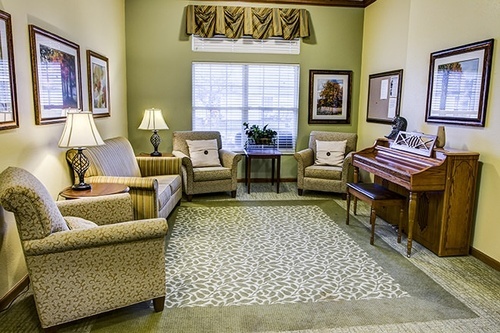 Brookdale Beavercreek has set itself apart by providing quality and compassionate Assisted Living services to seniors for many years. Located just 10 minutes from downtown Dayton, our community resides in Beavercreek, just off Interstate 675, and offers a wonderful combination of peaceful surroundings and excellent amenities (like shopping, dining and entertainment options). We understand that needing assistance with everyday activities doesn’t mean losing your independence. Our caring, compassionate staff is trained to provide seniors with the care they need in order to live a fulfilled life.Our community features a single-story building which makes it easy for those with limited mobility to access everything our community has to offer, including private apartments as well as areas for socializing, entertaining and dining. We are a pet-friendly community and we provide many services, such as trained staff on-site 24 hours a day, transportation services, and ongoing health monitoring, in order to best serve your needs. We work with residents to create a personalized care plan, tailored to their specific situation. This process is unique to Brookdale and allows us to provide service fees based on need. Our staff regularly reviews every service plan to ensure every resident has the assistance they need with daily activities such as medication management, cooking, cleaning, bathing, grooming, clothing selection and more. Integral to life at Brookdale Beavercreek are the programs, outings and opportunities for our residents to engage physically and socially.